Things to do under a Retractable Awning. Eclipse Awning Life Under the Awning Blog How Many Things can You do under a Retractable Awning? How Many Things can You do under a Retractable Awning? You’ve considered getting a retractable awning, but you may be wondering exactly what a retractable awning can do to make your life better and what purpose it will serve in your outdoor activities. Well there are plenty of things that you can do under the awning. 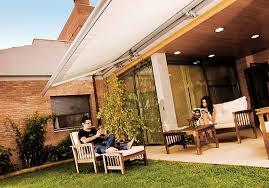 For instance, one of the best retractable awnings that is available is the cassette awning. You can view the many different styles in the available cassette awning pictures. In the cassette awning pictures you’ll see that people have found a number of great ways to get the most out of their awning. You can use your awning as a shade to cover the area next to your pool, you can even cover your pool with an awning that extends far enough, allowing you to enjoy a cool, shady swim. You can host dinner parties and keep your guests out of the blazing sun, and even use it as a convenient cover for your porch. In fact, the possibilities are endless. Imagine your children or guests playing and having fun outside without the fear of being burned by the sun. Imagine the outdoor picnics and barbeques that you can enjoy. Best of all, retractable awnings are great for letting you just sit back and relax while you enjoy the day with a cool beverage and a good book. Take a nap, play board games outside in the fresh air, do anything you want, all under the cool comfort of your own shade systems retractable cover. Another option is the exterior zipper shade. The exterior zipper shade allows you to extend the area of your usable living space even further. The shade allows you to enclose your space and use it for whatever you’d like. Think of it as having a screened in porch that you can open and close at will. If you wished, you could close off your porch or deck and use it as a second living area. You can watch television or even ‘camp out’ in your enclosed space while you enjoy the refreshing breezes that blow through your new room. This particular shade systems retractable cover can even be used if you just want to close off your windows or large doorways. This allows you to keep bugs and excess heat out while allowing cool air to blow in. .